Our Engineering Design Program is Kindergarten through High School. Through real world experiences and project based learning our students our students solve design problems. We focus on 21st Century Skills and creative problem solving utilizing a multi-disciplinary approach. We are vertically aligned to provide age appropriate engineering challenges ranging from introductory exposure to paper airplanes to job shadowing and internships. Together we spearhead the STEAM (Science/ Technology/ Engineering/ Art/ Math) programming and curriculum at Drew. Drew Charter Senior Academy Students win Prestigious Inventeams grant! 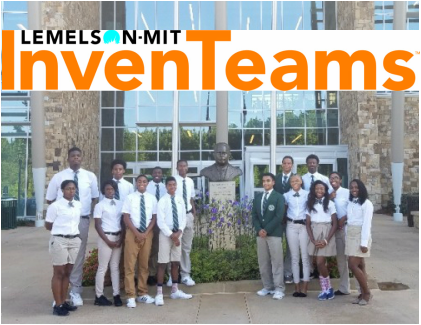 A group of 11th and 12th grade Engineering students at Drew’s Senior Academy was recently selected to receive the Lemelson-MIT InvenTeam Grant, a highly competitive $10,000 award they will use to invent a device they hope will reduce hot car deaths among children and pets. These incredibly talented, motivated students will have the opportunity to present their work at MIT next year and have set up a GoFundMe campaign to cover their travel expenses. Donate now and let’s get these superstars to MIT! Drew Wins Prestigious Technology Association of Georgia STEM Award! To see a video of the awards ceremony click ﻿here﻿.